Our 17-day Kenya safari last month was a lifelong dream come true. Exploring the country’s finest National Parks, wildlife reserves, and community-based conservancies blessed us with a cornucopia of heart-swelling memories we cannot wait to share. The diverse array of animals in Kenya proved even more astounding in person than we had imagined. 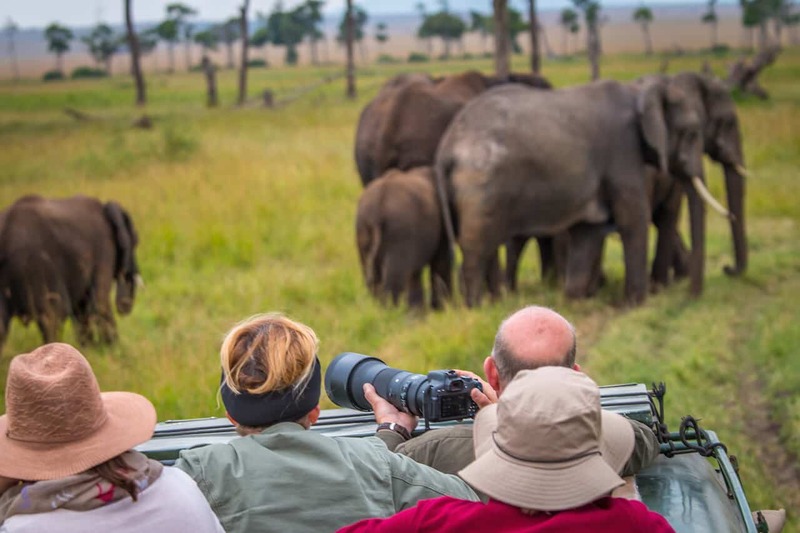 From the famed Big 5 mammals and beautiful birds whose dazzling colors would overwhelm an artist’s palette to the “Northern 5” and “Ugly 5,” the endless parade of Kenyan wildlife provided eye-popping sightings on a daily basis. I realize that might sound like hyperbole. 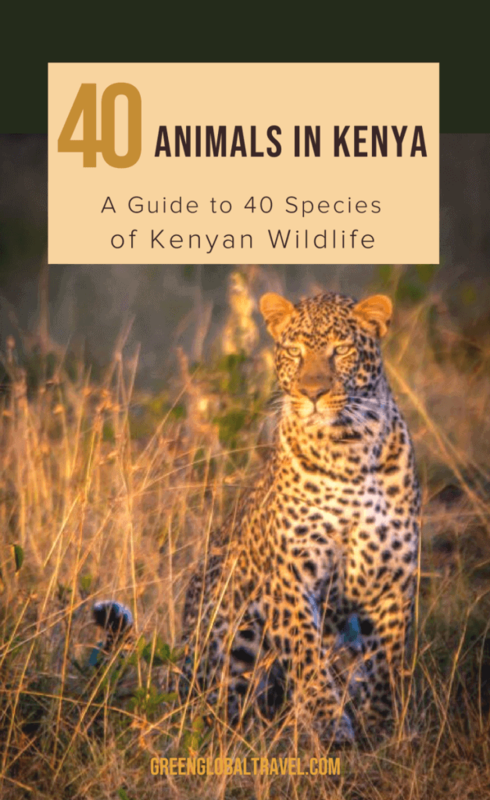 But as proof, we offer these 40 fantastic photos of some of our favorite Kenyan animals, including lesser-known species such as the Eland, Large-spotted Genet, Gerenuk, Rock Hyrax, and more! 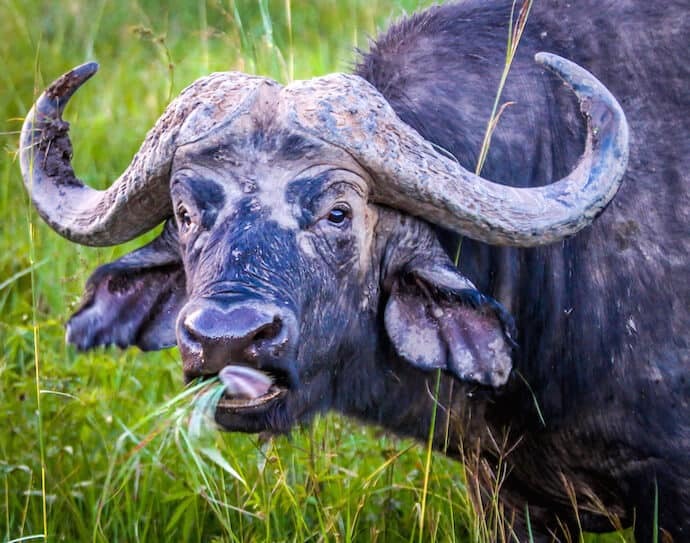 The largest of Africa’s buffalos, the Cape Buffalo weighs in at around 1,000 lbs. These massive creatures reside in many different grassy landscapes across Africa, feeding on huge quantities of grass. They’ve developed a symbiotic relationship with birds known as Oxpeckers. They can often be seen perched on the buffalos’ backs, eating ticks and other bugs and helping to keep wounds clean. Despite their large size, Cape Buffalos are highly sensitive to the sun and generally try to avoid the heat by staying in tall grass relatively close to a body of water. Another sensitivity comes in the form of illnesses: These buffalo are susceptible to a slew of diseases that plague cows, such as sleeping sickness. One of the most iconic species in East Africa, the African elephant is a memorable sight. At an average height of 11 feet, these majestic creatures stand tall and strong, with adults usually weighing in at around 6 tons (8,000 lbs). They also serve a vital role in the East African ecosystem. Elephants use their massive strength to knock down trees in order to get to the most tender leaves. In doing so, they create open areas for grasslands, which provide food for countless other herbivores. Known for their elegant ivory tusks, these animals are increasingly falling prey to poaching for this feature, which is then sold illegally in the ivory trade. But efforts are being made to preserve these animals and their preferred habitats. 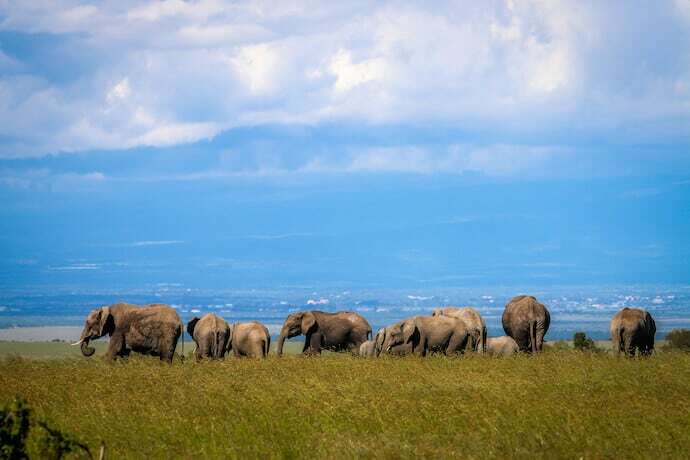 In Kenya, they’re creating elephant corridors in places such as Ngare Ndare Forest (connecting it to Mount Kenya Forest), allowing them to migrate without having to cross roads. With his luxurious mane and imposing roar, the male East African Lion is considered the king of all Kenyan animals. The average male lion weighs between 350 and 500 lbs., while its female counterpart weighs a little less. Lions are known for their hunting prowess, preying on a variety of mammals such as gazelles, buffalo, zebras and more. The females tend to do most of the actual hunting, but the males usually get “the lion’s share” of the kill. Unlike other big cats, Lions are noteworthy for living in prides with their own clearly-marked territory. Prides will generally share their meals together, although some single male lions (known as bachelors) do hunt on their own. 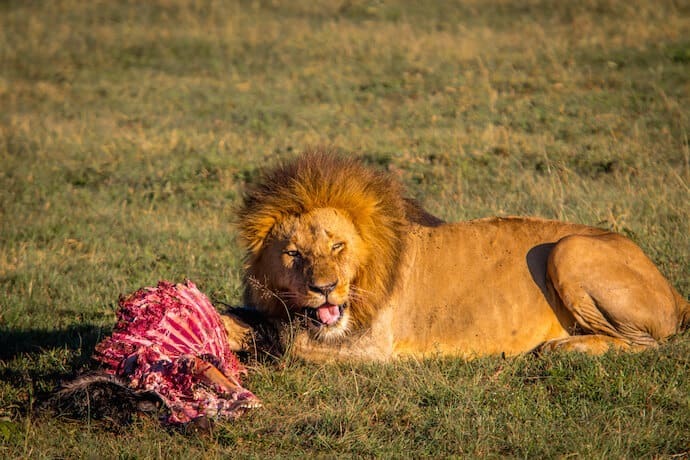 While the one pictured above feasted on his Wildebeest kill, we watched as 30+ Hyenas, Jackals, Vultures, Eagles and other predators waited for him to finish. Only when he walked away did they converge to feast on his leftover scraps. 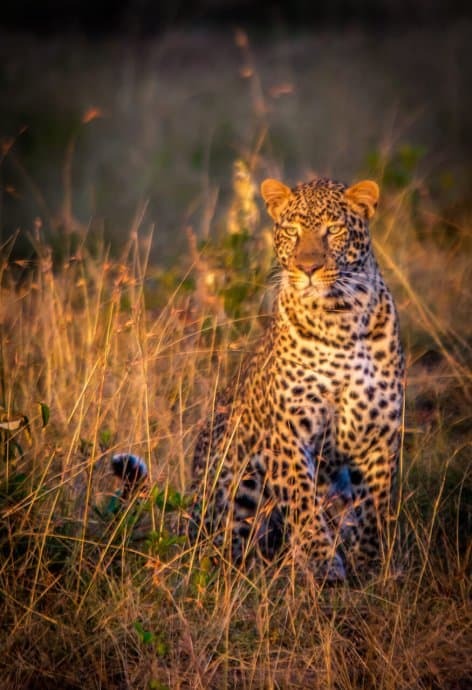 Preferring to live in a heavily forested area, leopards are well-known for their distinctive spotted coats. Their spots are roseated, so they look less defined than those of other cats. Leopards are excellent hunters, sneaking up on their prey and attacking without a warning. Along with hunting, leopards are athletic all around, with skills in swimming, climbing, and strength. Unlike the cheetah, its spotted counterpart, leopards prefer to stealthily stalk their prey and pounce rather than run after it. Their strong senses of smell and sight help them track and attack their prey, which is sometimes much larger than the leopard. Marked by a distinct horn (or horns) on its forehead, the rhinoceros comes in many varieties, including black and white. Rhinoceroses are known for being solitary creatures and keeping clear of one another, but the white rhinoceros can be found in small groups. Black rhinoceroses differentiate from others for their quick tempers and tendency to react against any unexpected noise. Like the elephant and its tusks, the rhinoceros faces danger because of its noteworthy horns, which poachers take and sell illegally. However, these large creatures are faster than they look and can run up to 30 mph, which could help them evade predators. No one has ever successfully bred rhinos in captivity. 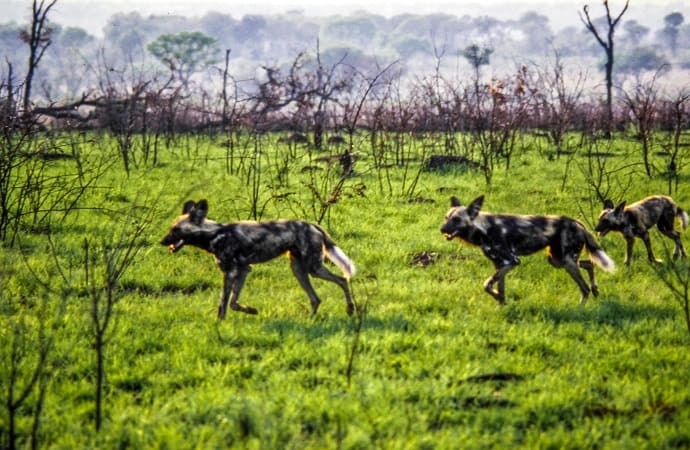 But scientists working in partnership with Kenya’s Ol Pejeta Conservancy have finally (after two years of trial and error) figured out how to retrieve eggs. The next step will be an in vitro fertilization procedure in an effort to save the critically endangered Northern White Rhino. READ MORE: Killing For Conservation- Can Hunting Save The Black Rhino? Looking like a cross between a goat and a gazelle, East African Oryx (which is also known as the Beisa) are easy to spot due to their large antler-like horns. These antelopes are colored brown, black, and white, and reside in the savanna and desert climates of northern Kenya. Like camels, these animals have genetically adapted to conserve water, and do not sweat until temperatures reach around 116 degrees Fahrenheit! Other notable behaviors are the presence of a head cow and “alpha bull,” who are in charge of the herd. 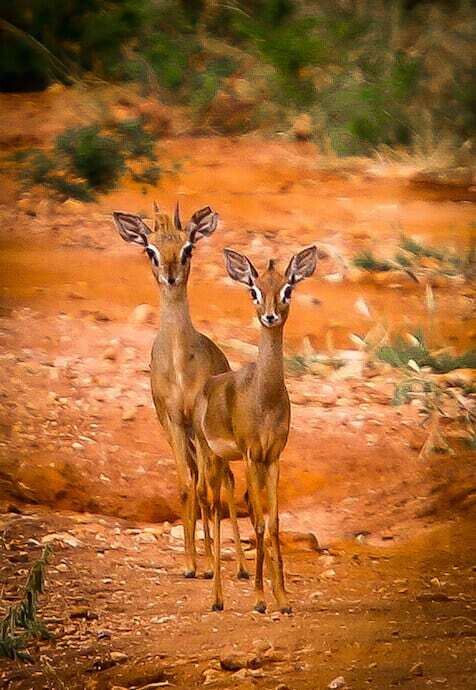 Also known as the Giraffe Gazelle or Waller’s Gazelle, the Gerenuk (meaning “giraffe-necked” in Somali) looks like an ordinary gazelle except for its pencil-like neck. The rarest of Kenya’s “Northern 5” species (which are so named because they’re found north of the Equator), these elegant-looking animals take advantage of their long necks and legs by reaching for food in trees and shrubs. Gerenuks are herbivores who feed on fruit and flowers (we saw them eating ones in Meru National Park that looked like morning glories) by yanking the branch toward them, rather than eating close to the ground. Compared to other antelope species, they are quite shy, living in small herds no larger than eight animals. With their identifiable stripes, zebras are one of the most well-known and beloved Kenyan animals. 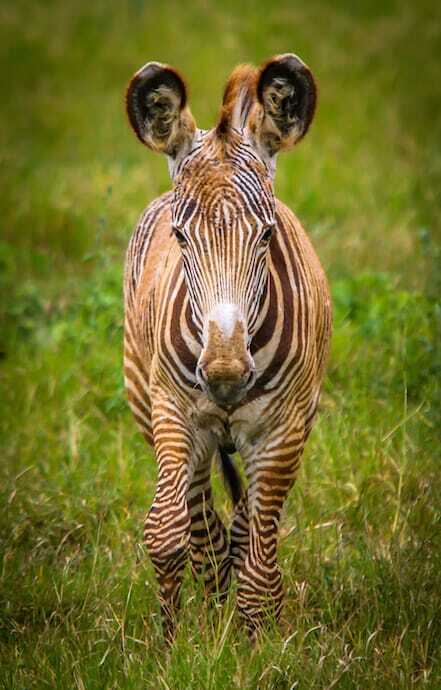 The Grevy’s Zebra is the largest zebra species, with larger features to match. Grevy’s zebras have larger ears and more stripes than other zebras. These zebras have 80 stripes in all, and are known for their strong sense of sight. This zebra is also unique because of its moniker: In 1882, it was named for the president of France, Jules Grevy, who was gifted with one of the unusual-looking zebras. Unfortunately, this zebra is increasingly endangered due to habitat loss and drought, with around 2700 left in the world. 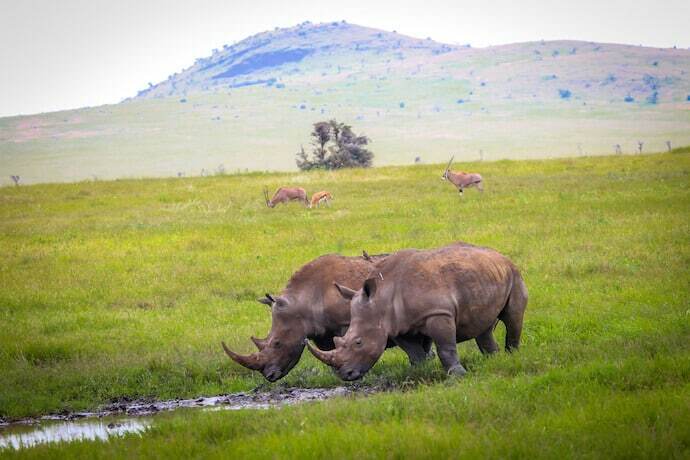 Approximately 11% of those can be found in Kenya’s Lewa Conservancy, where they are a common sight. 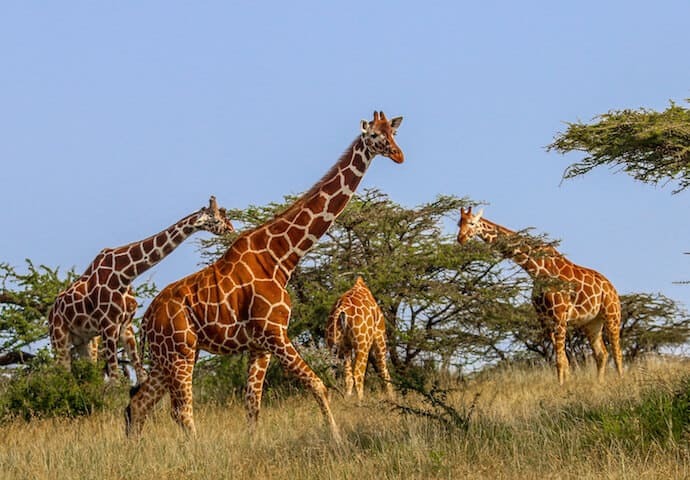 Marked by their noteworthy long neck, the Reticulated Giraffe is another relatively common sighting in northern Kenya. These giraffes use their long necks to feed in the tops of acacia trees, where they gather leaves and fruit. You can usually tell which trees they’ve feasted on: Since they tend to eat from the top (where the freshest leaves are), the trees look a bit like hats. They’re hardly ever seen drinking water, and look quite funny when they do. Their long necks combined with powerful eyes make for good eyesight. Each giraffe is unique and can be identified by the slightly different pattern of spots on its body. You can tell how old a giraffe is by checking out the color of his/her spots. The darker the are, the older the animal is. 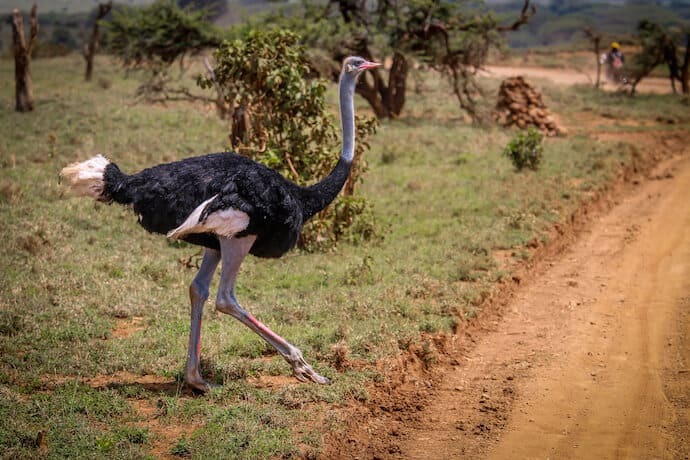 Only recently established as a separate species from the Common Ostrich, the Somali Ostrich is noticeable for its blue neck and legs, with makes having bright red markings on their shins during mating season. These large, flightless birds can be found in various different types of habitats, such as grasslands and woodlands. They are unfortunately suffering from habitat loss, but stronger conservation efforts have been proposed in order to rejuvenate their dwindling population. The female Somali Ostrich is slightly bigger than the male. They are colored slightly differently as well, with females being brown with pink-peach highlights. 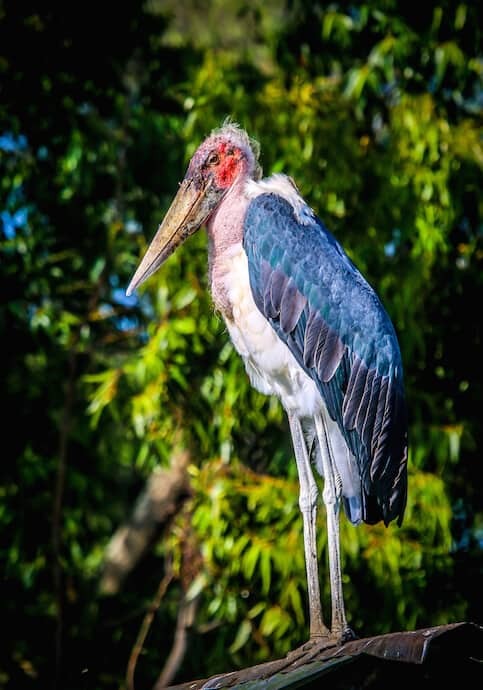 With a pink neck pouch, black wings, and a hunched stature, the Marabou Stork is certainly not the prettiest bird in Kenya. However, these birds serve an important purpose in their ecosystems, scavenging on various foods that include carcasses, smaller birds, termites, and more. The neck pouch is a useful feature, as it helps these birds produce a distinctive croaking sound and is most often heard during mating season. The Marabou Stork is also distinguishable for its unfeathered head and long, white tail feathers, which are called marabou. As a result of their caricature depiction in The Lion King, Spotted Hyenas are often associated with an evil cackle and scheming ways. However, there is much more to this misunderstood creature than meets the eye. 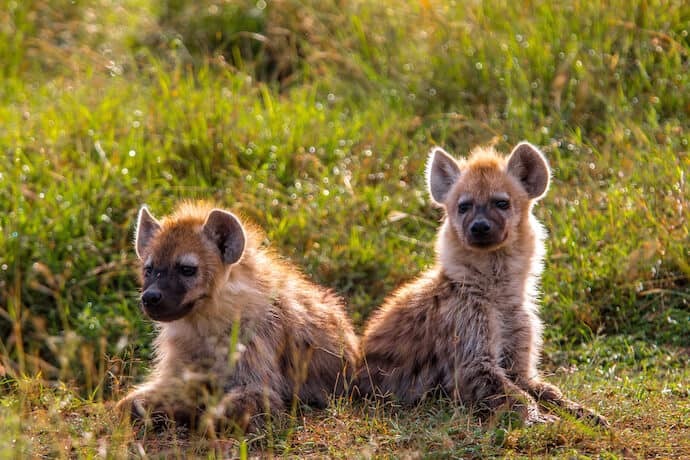 Hyenas are remarkably strong, with powerful jaws and keen hunting skills, preying on a variety of Kenyan animals that includes various antelopes, Cape buffalo, and zebras. They are also fast, able to reach speeds of 37 mph in short bursts in order to catch their prey. Hyenas have a complex matriarchal society in each clan, but certain sounds are used to unite the clan together when there’s danger or a hunt afoot. Small pups like these 6-month-olds will stay behind during a hunt, and adult females will watch over each other’s pups. Pumbaa, one half of the comic relief duo in The Lion King, served for many viewers as a hilarious introduction to another prominent Kenyan animal, the Warthog. But Warthogs are much smarter and faster than they may appear. They can run up to 34 mph in order to avoid predators. They’re also one of the most cautious animals we saw in Kenya, often running from our safari vehicle before we had a chance to snap their photo! 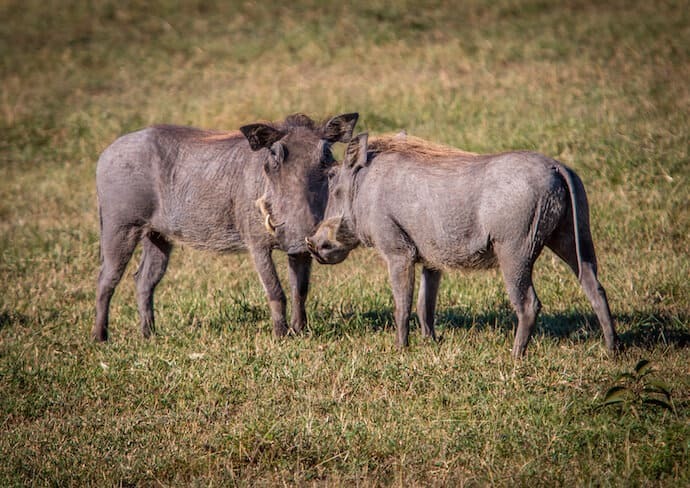 Like their farm-dwelling counterparts, domesticated pigs, Warthogs will squeal and grunt to communicate with one another. What really sets them apart (and gives them their name) is the telltale warts on their bodies. These warts are used as protection during mating season, when male Warthogs (a.k.a. boars) fight each other to win over females (a.k.a. sows). Named for its white back, the White-backed Vulture is gray and white in color. 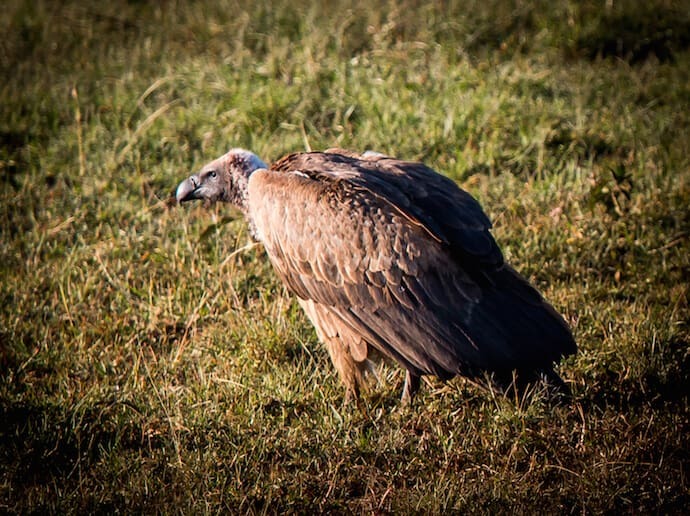 Like other vultures, they scavenge on animal carcasses and do not have any natural predators. They like to circle around open savannas and plains areas, using their strong eyesight to identify potential food for themselves. Despite its lack of predators, these birds are endangered because of habitat loss and hunting amongst other threats, demonstrating the interconnected nature of scavengers with other creatures. Originally known as the gnu, Wildebeests gained their current name from the Afrikaans language because of their wild and intimidating appearance. While it resembles a buffalo more than anything, wildebeests are actually a larger antelope species marked by their large, pointed horns. Despite their large size, wildebeests are prey for many major predators in Kenya, such as lions and hyenas. Wildebeests are herbivores, feeding on grasses and other plants. They move in fairly large herds, which can best be seen during their Great Migration north from the plains of the Serengeti to Kenya’s Maasai Mara every summer. What attracts them to Kenya is the Mara’s red oats, which they and the zebras seem to consider a delicacy. 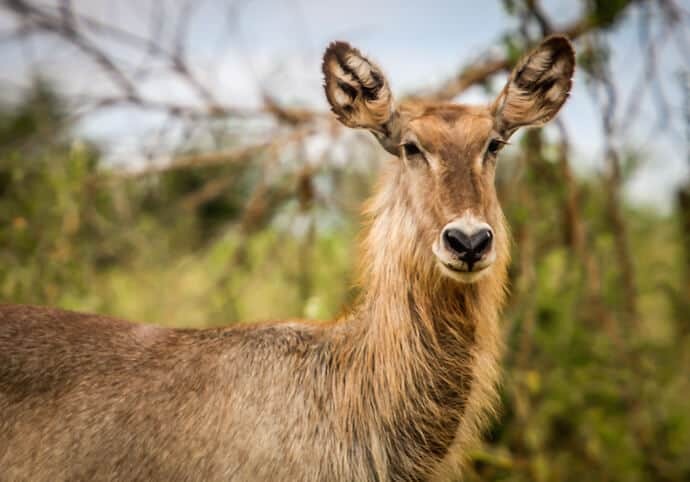 Named for their preferred proximity to water, the Common Waterbuck feeds on plants near bodies of water in various habitats, including savannas and forests. 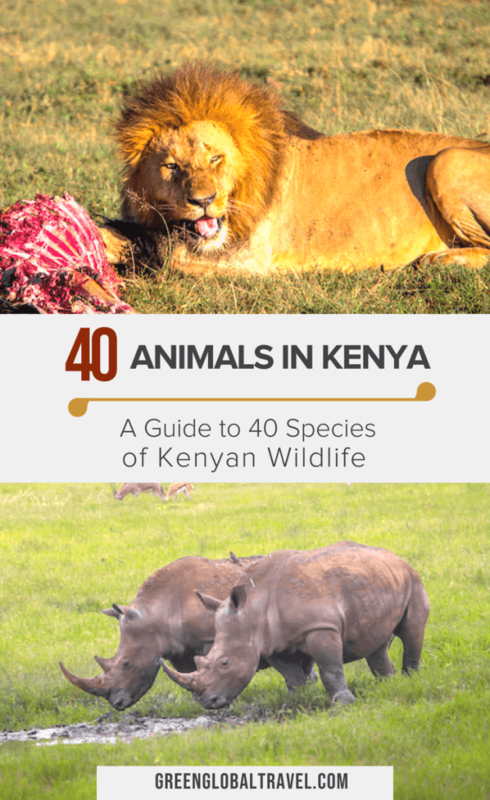 These creatures are designed for protection from Kenya’s predators in several ways. Their eyes are situated on the sides of their face in order to maximize their field of vision. Their bodies give off a strong odor that helps to ward off predators as well. Another notable trait is their long horns, which are sometimes used by males when fighting over territory. But our favorite feature of the Waterbuck is their adorable noses, which resemble a heart shape if you look closely. Just don’t confuse them with the Hartebeest, another African antelope species! Standing up to 5 feet tall at the shoulder and wishing up to 2000+ pounds, the Eland is the largest antelope species in the world. The massive animal looks a little like a cross between an antelope and a cow. These antelopes live in various ecosystems in East and Southern Africa, ranging from mountains to plains and everything in between. 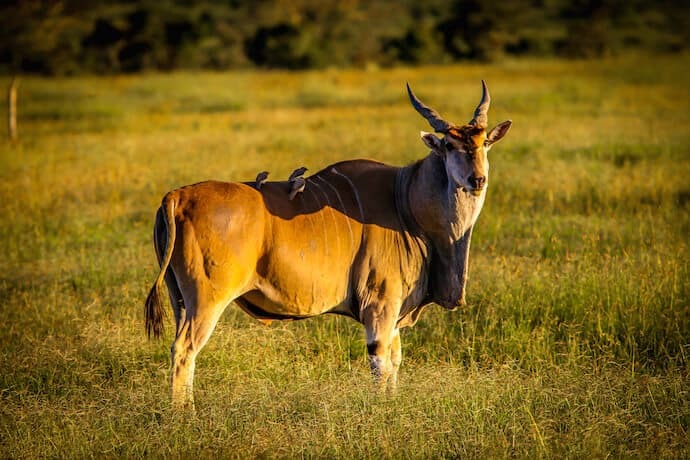 Elands usually travel in herds of various sizes but sometimes wander alone, grazing on grasses and other plants all year-round. Both males and females have huge horns, which they use to detach high tree branches and grab food. Although they are very large, Elands are actually quite shy. 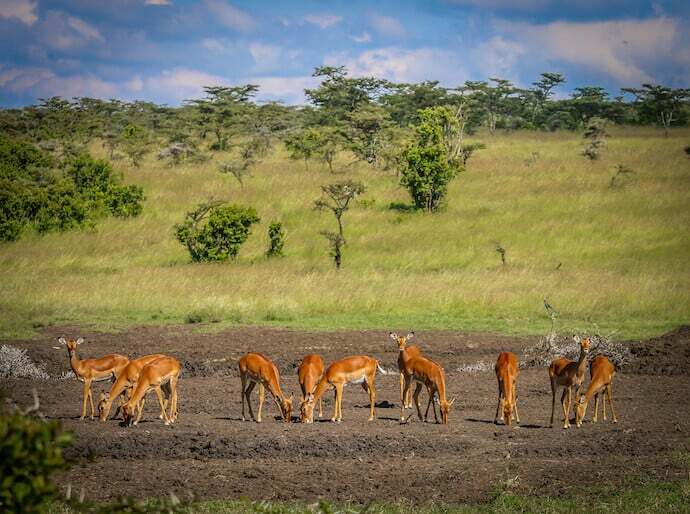 Perhaps the most familiar of Kenya’s antelope species, Impalas are best known for their speed and agility. These antelopes feed and run quickly in herds overseen by a dominant male. Young males are often kicked out of the herd, roaming as bachelors until they’re strong enough to fight the alpha male for breeding rights. Impalas can leap up to 33 feet in the air, which helps them to avoid predators and send signals to other Impalas, but is also occasionally done just for fun. 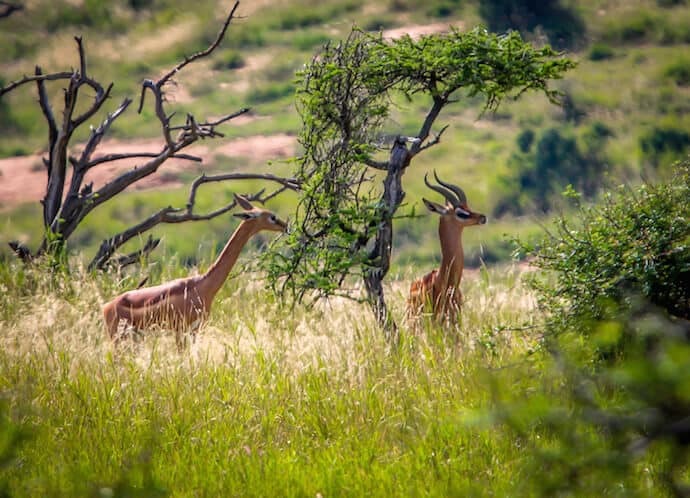 Impalas have adapted to feed on a variety of plants depending on the season, eating grass shoots in the wet months and shrubs and other dry herbs in the dry months. One of the tiniest species of antelope, Kirk’s Dik-Dik lives in dry and grassy habitats, feeding primarily on fruit, leaves, and grasses. These little antelopes only grow to about 14 pounds and mate for life, repeatedly traveling along the same trails that wind through the grass and bushes. If one partner dies, the other one will often be so stressed/depressed that they’ll stop eating and die soon after. Their large eyes help them to see and also hold a preorbital gland, which produces a substance that the Dik-Dik uses to mark its territory. They are targeted by many predators, and survive by staying hidden in the bush. Living primarily in floodplains, the Topi is also found in the savanna and other dry habitats. 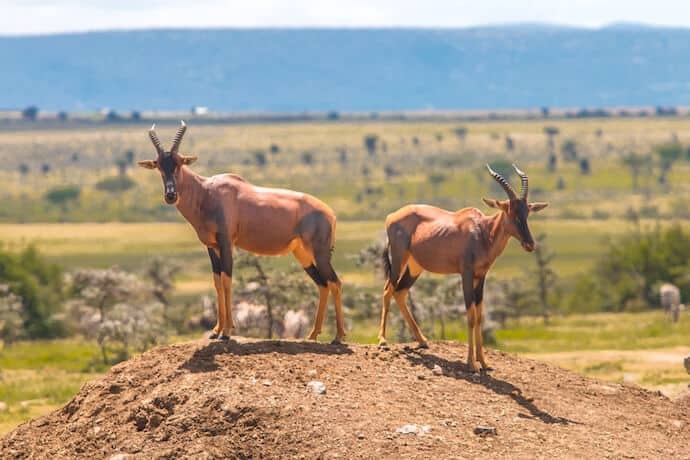 These reddish-colored antelopes are also known as the “blue jean antelope,” for the distinctive blue markings on their legs. Topis feed on very specific plants, chewing for long periods of time before resting and then grazing again. 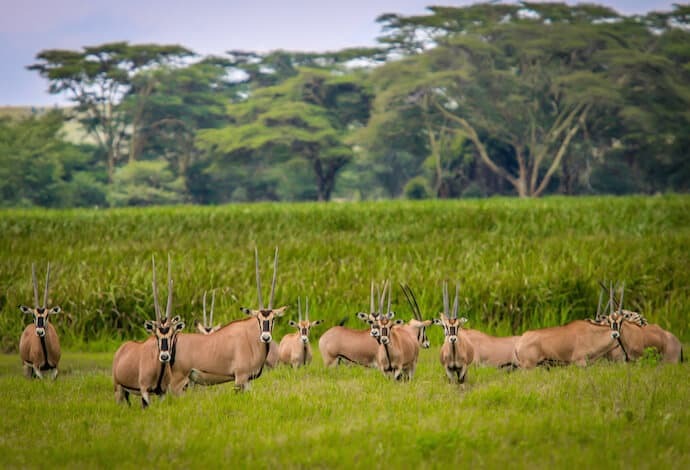 Unlike many other antelope species, the Topi is very sociable and interacts with other species, such as wildebeests and zebras. Within their own species, Topis live in herds ranging in size from 15-100, and they establish smaller herds when necessary. They prefer to sleep standing up, usually on a high point and facing in opposite directions as if they are keeping watch. 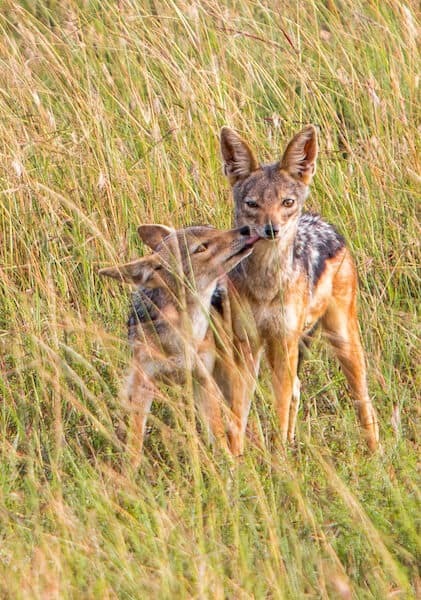 Named for the streak of black hair along its back, the Black-backed Jackal lives in open areas that are not completely covered by tall grasses or bush. These animals are active both day and night, hunting and scavenging on several different types of animals, including various antelopes species. They will hunt individually or in pairs, but also dine on plants and other vegetable matter. Black-backed Jackals are clever and have been able to take advantage of human development. They often feed on scraps left behind by humans or on domesticated animals (such as cats and dogs) that humans keep as pets. Like wolves and coyotes, jackals are among the few mammal species that generally mate for life. Mated pairs are usually very territorial, with both male and female marking and defending their territory. The fastest land animal in the world, the Cheetah is known for its lightning-fast speed and its well-defined spots. Unlike its spotted counterpart, the Leopard, Cheetahs do not stalk their prey. Instead they run after it, dashing at speeds of up to 75 miles per hour. Despite their great speed, Cheetahs are considered shy and less aggressive than other big cats. So they have to quickly eat their prey before a scavenger comes and steals it away. Unlike Lions, Cheetahs are solitary animals. But they sometimes live in coalitions with other Cheetahs, constantly moving around without settling in one place. 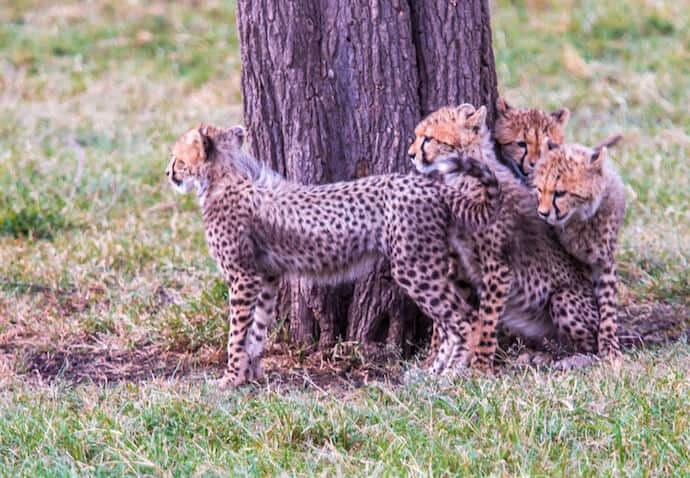 These four Cheetah cubs, spotted romping with their mom in Kenya’s Olare-Motogori Conservancy, were 4.5 months old. 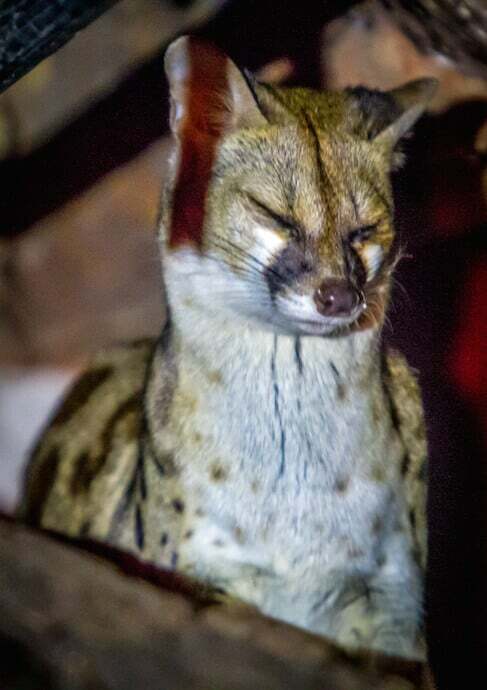 Looking a bit like a spotted raccoon or a small hyena, the Large-Spotted Genet is actually related to the weasel. It feeds on small mammals, birds, plants and more. These animals are distinguished from the Small-spotted Genet by their black-tipped tails and large, black spots all along its body. The Large-Spotted Genet is solitary and generally spends its time in densely-covered habitats such as forests. They’ll utilize this area both for its proximity to water and as protection from predators. These animals operate mostly at night, and pounce on their prey in order to catch it. 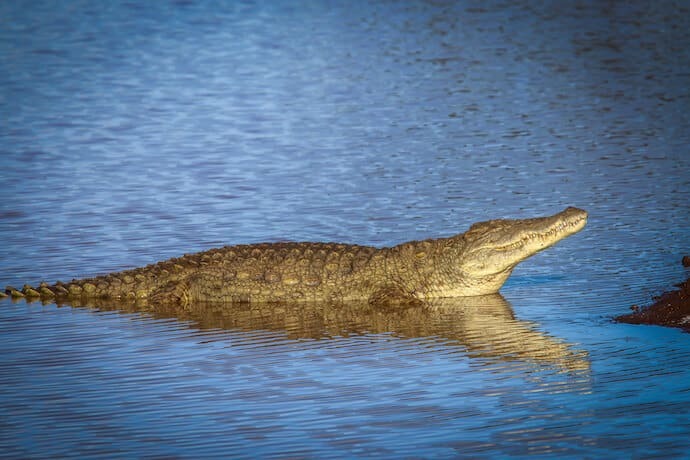 Named for its freshwater home, the Nile Crocodile lives in the Nile River Basin as well as other rivers and swamps throughout eastern Africa. These reptiles have a bad reputation as vicious predators, feeding on just about anything they come in contact with (including humans). Even when they’re just relaxing in the sun (such as the one pictured above), these massive reptiles can be a terrifying sight. Their incredible size– ranging from 8 to 14 feet long and weighing 500 to 1,200 pounds– and razor-sharp teeth make them one of Africa’s most formidable apex predators. Nile Crocodiles are also known for eating plants and small animals, so they do not really discriminate when it comes to their food sources. With long legs like a deer and a gorgeous multicolored coat like that of a big cat, Wild Dogs are an unusual animal to say the least. These dogs have large, upward-pointing ears and communicate with one another through a distinctive series of sounds and touches. These dogs are predators that live in packs of up to 30 members. They’re remarkable in the way that they hunt together, taking down larger Kenyan animals (such as Wildebeests and other antelopes) and feeding on smaller mammals in between big meals. Named for their characteristic grey heads, this small, multicolored bird is usually seen perched in the low branches of trees, from which they hunt. Arguably the bird’s ,most stunning feature is its black and bright blue wings, which are coupled with a white and brown belly and a large pinkish orange bill. 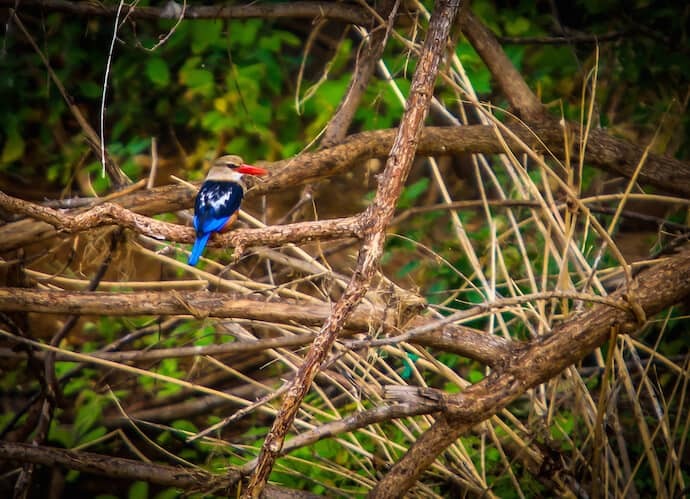 The diminutive Grey-headed Kingfisher feeds on small bugs like grasshoppers and beetles as well as small lizards. They live near water in wooded areas, often watching silently for long periods of time before they dive after their prey. 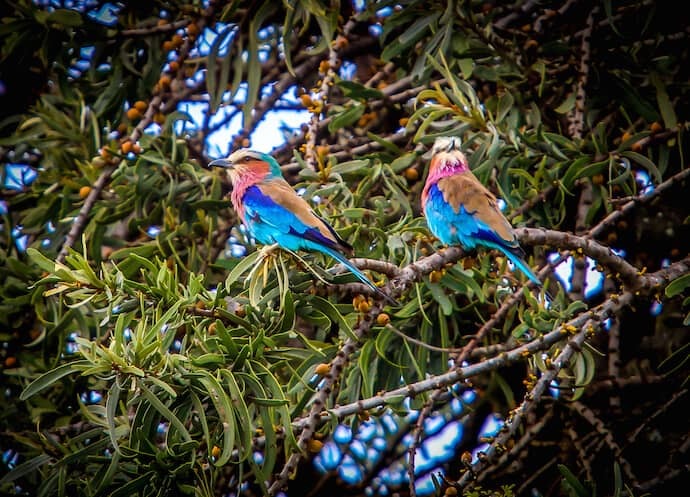 The feathers of the Lilac-Breasted Roller, which is officially the National Bird of Kenya, contain almost every color of the rainbow. With lilac plumage, these birds have blue stomachs, green heads, reddish-brown faces, and brown and blue wings. The Lilac-breasted Roller has large wings and flies well, residing in nests in trees. 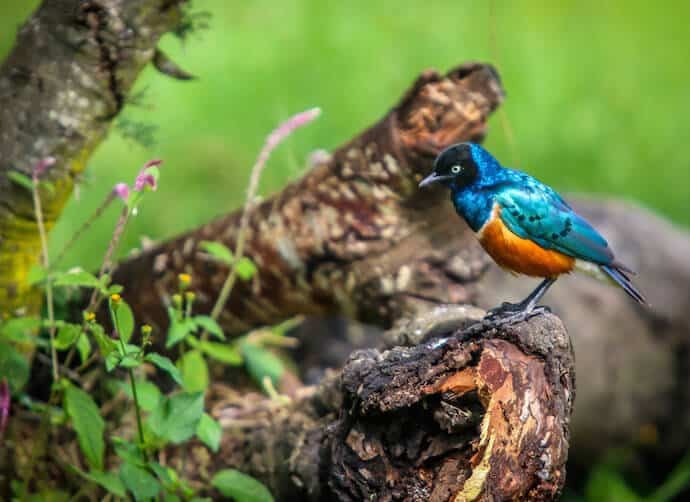 These small birds feed on a variety of smaller creatures, like grasshoppers, lizards, beetles and more, diving to catch their food on the ground before flying swiftly back into the trees. With a neck that matches the primary color of their favorite prey, the Little Bee-Eater has a yellow neck, green back, and reddish-orange front. This bird is the smallest of all the African bee-eating species, usually residing in bush areas near bodies of water. They feed on bees, of course (amongst other small insects, like wasps), and are skilled at removing the stinger before consuming their prey. These birds differ from other bee-eating varieties because of their nesting habits. The Little Bee-Eater actually prefers to nest in the sand! A reddish orange and green belly stands out against the grey body of the male Red-Bellied Parrot, which mainly lives in dry bush and wooded areas. 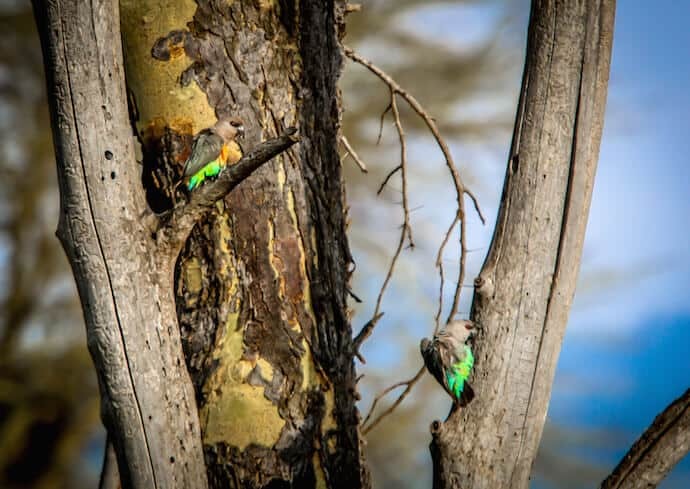 The presence of four toes on each foot– two on the front and two in the back– makes it easy for the Red-Bellied Parrot to perch in the trees. Like most of their kind, the Red-bellied Parrot pairs for life. They’re often seen eating seeds and fruit, using their beaks to break open their food. These birds are fast flyers and often live in small groups, playing an important role in their ecosystem by spreading the seeds they consume. The iridescent colors of the Superb Starling truly live up to its name. 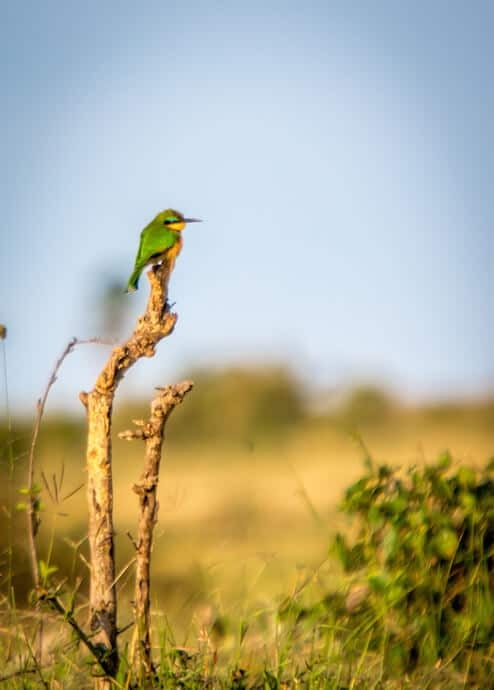 This bird is small, but very noticeable and commonly seen throughout East Africa. It’s colored bright blue and green on its head and wings, bright orange on its stomach, with a few sections of black and white in between. Superb Starlings primarily eat fruit and seeds, along with some small insects. They live in the grassy habitats of the savanna, feeding on the ground. Although they are small, the Superb Starling makes its mark with various loud noises that make up its distinctive song. 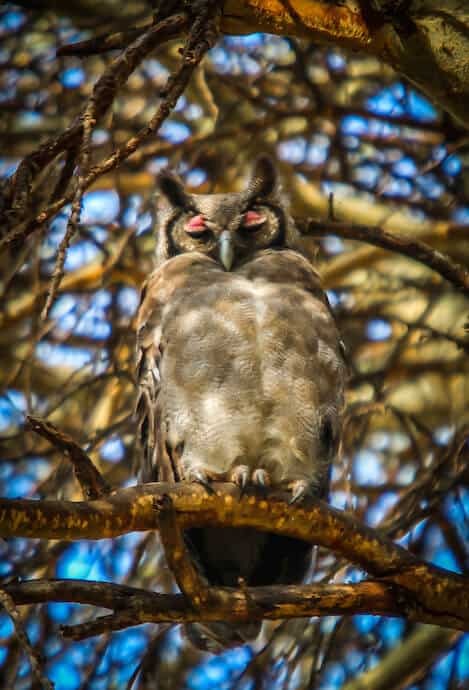 One of hundreds of owl species found around the world, Verreaux’s Eagle-Owl lives in the mountainous and forested areas of Kenya. But the species can also adjust to other environments, so long as nesting areas are available to them. The species was named after French naturalist Jules Verreaux. Also commonly known as the milky eagle owl or giant eagle owl, it’s the largest owl on the continent, measuring up to 26 inches long. With a wingspan that can get up to over 5 feet, these massive birds feed on several different types of prey, including bats, insects, and rodents. Eagle-Owls appear to be surprised due to their bright orange-pink eyes and ears that look like raised eyebrows. These features make them easy to identify amongst other owl species. Long legs, red eyes, and a light grey coloring characterize the Eastern Chanting Goshawk, which can get up to 19-21 inches long. This intimidating-looking bird of prey lives in open, semi-arid areas, where it feeds on other birds, insects, and lizards. 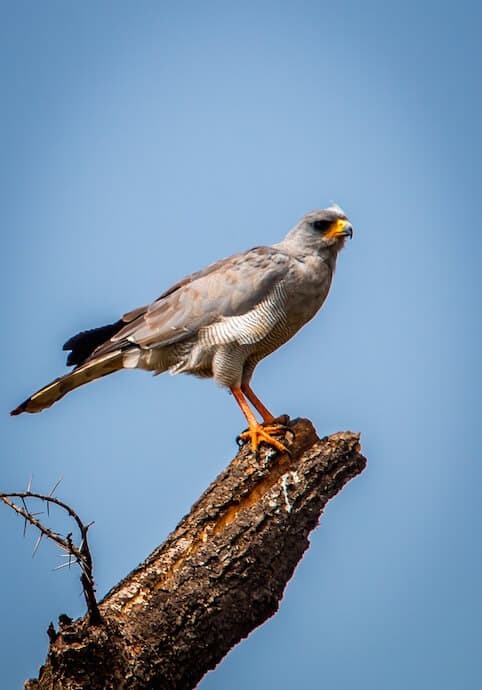 Like other hawks, the Eastern Chanting Goshawk has a huge wingspan of about 41 inches and can be found perched in trees waiting to catch their prey. Their name comes from a mating habit of the species: The males whistle, or chant, in order to attract females during breeding season. While most birds of prey are thought to be large and imposing, the Pygmy Falcon defies this stereotype. This small bird only weighs between 1.9 and 2.34 ounces, and they’re much smaller than the average falcon species. 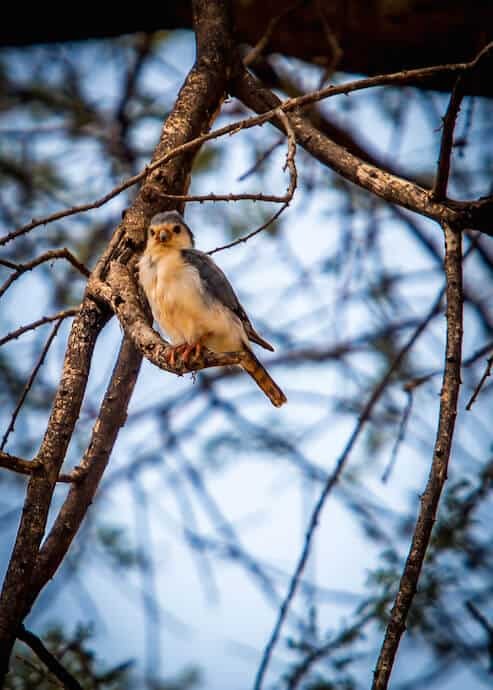 These birds reside in arid regions with tall trees in which they can roost, feeding on insects and lizards by flying down and snatching them off the ground. These little birds are also known for being noisy during mating season, singing different high-pitched sounds to attract their mates. 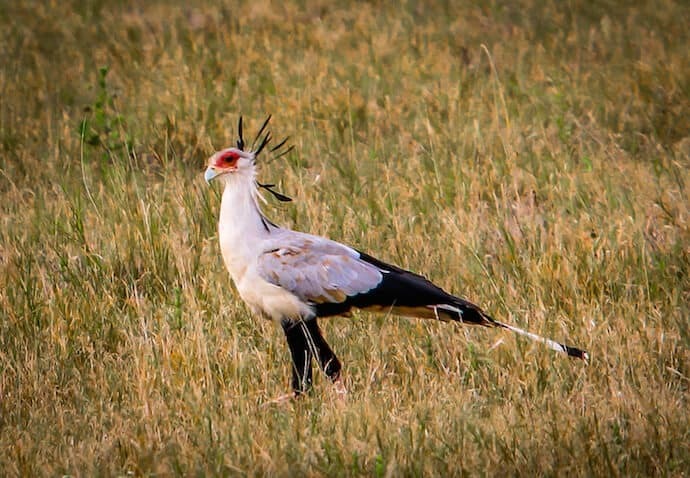 The name of these birds sounds strange, but the Secretarybird’s appearance is even stranger. The bird is named for the fashion of the 1800s, when they were first discovered. Male secretaries of this time wore long gray coats and dark pants, resembling the gray feathers and long dark legs of the bird. These birds have unusual habits to match their unusual looks, spending most of their time walking on the ground rather than flying. They attack their prey in several different ways, such as stomping on it or stabbing it with their bills. As weird as these birds may seem, they are not to be messed with! 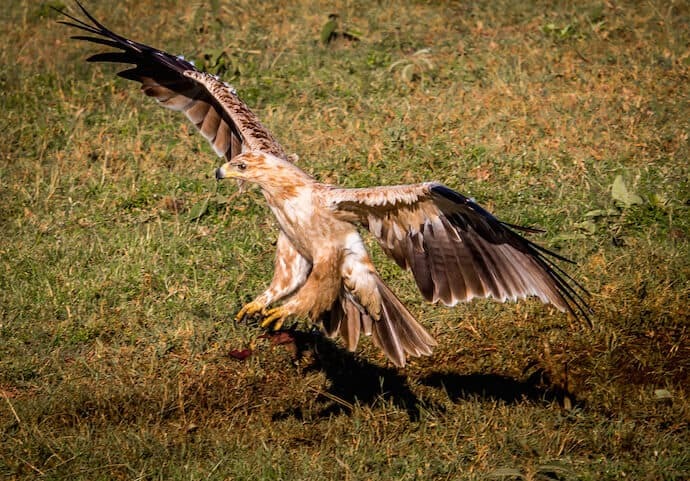 A brownish-colored body gives the Tawny Eagle its name. Related to the Steppe Eagle of Mongolia, it’s rather large for an eagle, measuring up to 30 inches long with a wingspan of around six feet. This powerful predator uses its massive wings to hunt for reptiles, mammals, and birds as well as scavenging for animal carcasses. The Tawny Eagle is tailor-made for hunting, with large, strong talons that capture prey and help the bird steal food from other predators. Found throughout much of Africa and southern Asia, these birds live in desert regions without the cover of trees. This allows them fly in search of food, hunting during the day and resting at night. Somewhat resembling a small bear (or a less-furry raccoon), the Banded Mongoose is characterized by the large black stripes across its back. These creatures primarily feed on insects like beetles as well as small mammals or reptiles (mice and snakes are their favorite prey) when necessary. They live in savannas and woodland areas, inhabiting abandoned termite mounds where they can easily come and go. 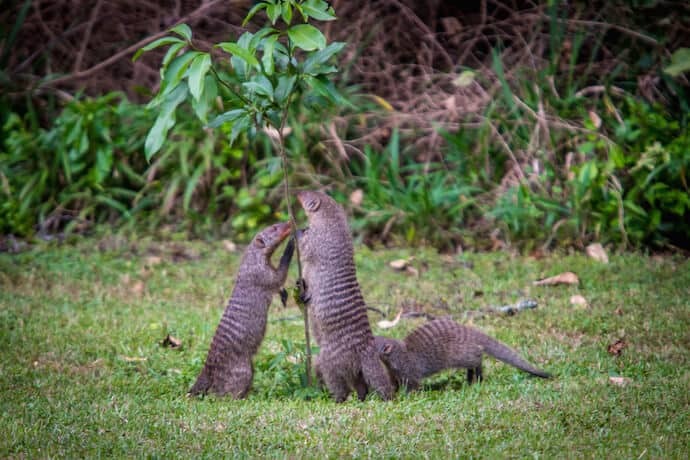 The Banded Mongoose is a social animal and lives in packs of up to 40 individuals, and these groups move around constantly. When they move, they tend to move as a unit, looking almost like rolling waves upon the sea. Also known as the Galago, adorable Bushbabies look a little like a tiny cross between a koala and a monkey. These unusual little creatures have pointed ears, long curled tails, wide eyes, and soft gray fur that give them an innocent, almost alien appearance. 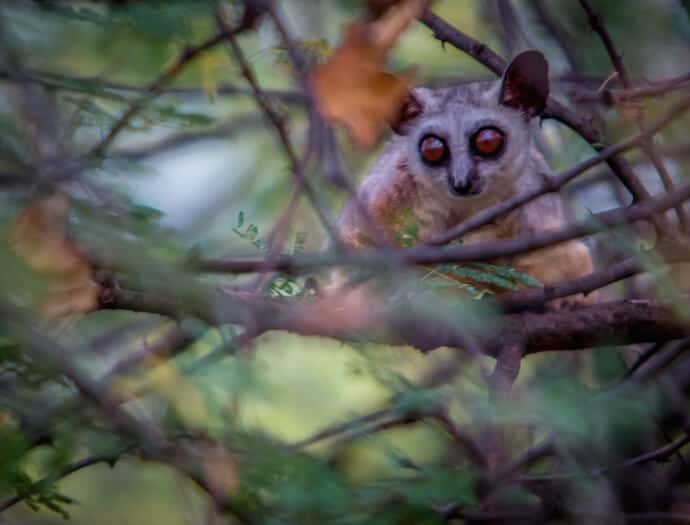 The Bushbaby primarily feeds on insects and fruit. They particularly enjoy the gum of trees, which they consume by picking through the holes in trees or scraping off tree bark. Like monkeys (to which they are related), these petite primates like to hop through the trees and sometimes sit upright on two legs. 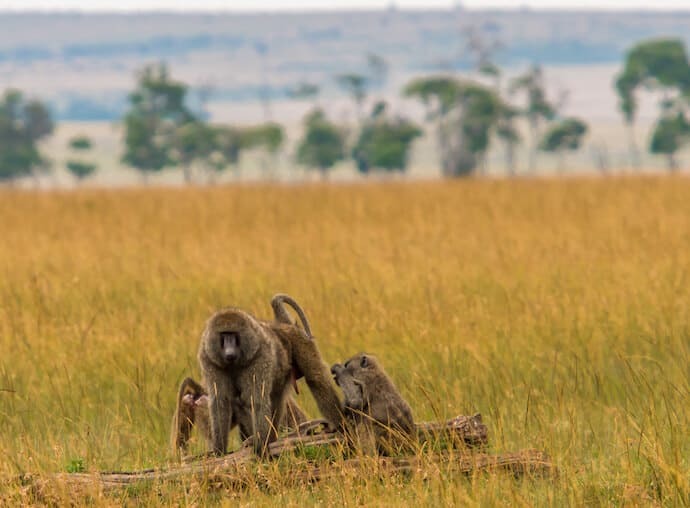 Living in savannas, Baboons are smaller than Gorillas, but bigger than typical monkeys. These animals spend their time moving between the trees and the ground, feeding on a variety of food ranging from small mammals and birds to fruit and plants. A group of Baboons is called a troop. These troops are tight-knit and complex social organizations consisting of up to hundreds of animals. The Baboon is one of the largest monkey species in the world. Their preference for grass helps them survive in areas where other monkey species cannot. Behind the Elephant and White Rhinoceros, the Hippopotamus is the third-largest land mammal on Earth today. 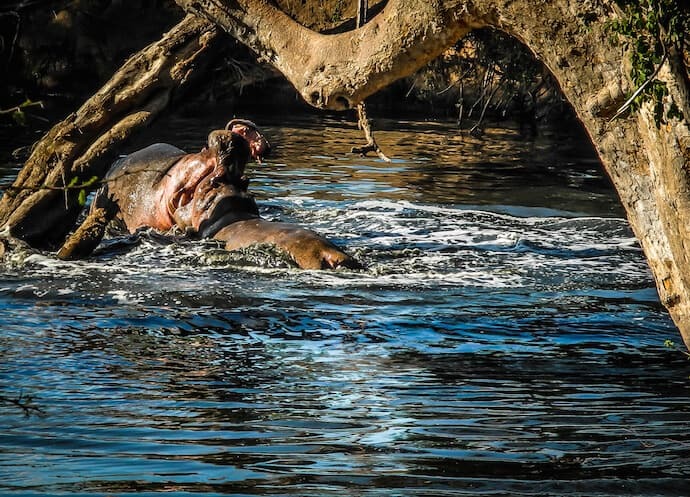 Adult Hippos average anywhere from 2,870 pounds (females) to 3,310 pounds (males). But despite its massive size and short, stubby legs, this behemoth is capable of running up to 19 miles per hour over short distances. These animals have strong gray bodies with thick skin and very little hair. They mud and water to keep themselves cool in the heat due to a lack of sweat glands. They may look scary, and they are– they’re actually responsible for more annual deaths (around 2,900) than Lions, Leopards, Sharks, or snakes. But Hippos use their teeth to feed primarily on grass, and their bodies retain nutrients for long periods of time. With the appearance similar to a large rodent, the Rock Hyrax is a brown, medium-sized mammal found in rocky areas of Kenya. These animals are well-suited to rocky environments, as their feet can easily latch onto smooth surfaces. They can often be found burrowed in the rocks for shelter, or laying out on the rocks to catch some sun. 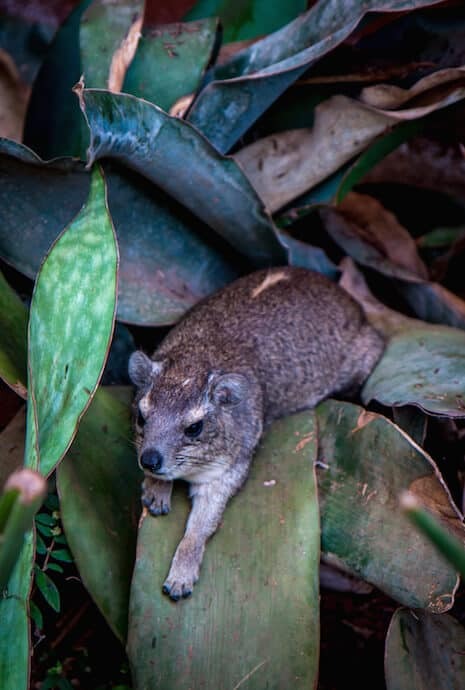 The Rock Hyrax primarily feeds on fruit and leaves, and they have three-chambered stomachs to help digest all that fiber! Our trip to Kenya was sponsored in part by Gamewatchers Safaris & Porini Camps, Cheli & Peacock Safaris, and the Elewana Collection. But our opinions remain our own, and we will never compromise our integrity or betray the trust of our readers. Anika Chaturvedi is studying journalism at the University of Georgia.